A century ago Frank Pick worked to make the London Tube not just efficient but also aspirational — an environment that would add dignity and delight to the daily commute. “The greatest patron of the arts whom this century has so far produced in England, and indeed the ideal patron of our age.” So wrote the architectural historian Nikolaus Pevsner in the early 1940s — a sweeping assessment all the more remarkable because the object of his praise was not a famous collector or philanthropist or curator. Pevsner’s “ideal patron” was in fact a career bureaucrat, the chief administrator of the London Passenger Transport Board — the CEO of the Tube. 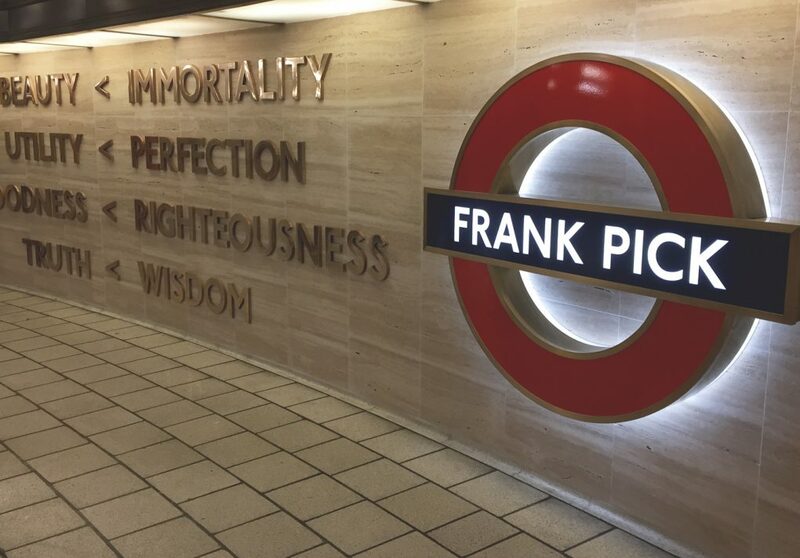 By the time of his death in 1941, at the age of 62 — the occasion for Pevsner’s eulogy — Frank Pick had spent his entire career working for the London Underground in one capacity or another, rising through the ranks to become head of the growing agency in the early 1930s. The Underground established a new model for the integration of public works with innovative design. Under Pick’s leadership, the London Underground developed its enduring visual identity and style. His many commissions include the original typeface by calligrapher Edward Johnston, introduced in 1916 and used ever since; the now iconic disc-and-bar roundel station marker, also by Johnston; the diagrammatic station map, created in 1931 by Harry Beck; and a series of stations designed by architect Charles Holden, several of which would later be recommended by Pevsner for landmark status. Pick employed emerging artists whose works would eventually be collected by the Tate, Guggenheim, and Museum of Modern Art; he commissioned tiles and fabrics from leading craftspeople including Harold Stabler, Paul Nash, Enid Marx, and Marion Dorn. The historian and curator Margaret Timmers aptly describes Pick’s approach as “holistic,” 5 and it set an important precedent for public agencies’ collaboration with artists and makers. Artists created images depicting how the vast metropolis had become newly accessible via the Tube. One of the initiatives that most exemplified Pick’s commitment to elevating the everyday experience of public transport was the poster design program. Beginning in 1908, the program grew quickly, and by the 1920s the Tube was featuring up to 50 new posters annually. Over the years the sizes were standardized, and graphic artists were encouraged to create uncluttered designs with minimal texts — a major departure from the typical railway advertisements of the period in which words and pictures were so jammed together that the results were unreadable from any distance. Within the new streamlined framework, artists were given the broad brief of creating images depicting how the vast metropolis had become newly accessible via the Tube. Pick’s marketing strategy was subtle and sophisticated; rather than the standard tack of putting the service at the center of its advertising, the posters offered a vision of the great city as seen through the lens of its rail network. In this way the Underground itself became one of the city’s defining landmarks. The artists were given wide creative latitude, and as a result the posters often reflected the emerging art movements of the day. “Pick recognized that the main customer, the ordinary Londoner, needed the reassurance of the familiar, but he also saw that public taste could be developed by exposure to the unfamiliar, the adventurous and, occasionally, the shocking,” says Evdoxia Apostolou, a curator at the London Transport Museum. 6 Pick’s appetite for the experimental gave London commuters a taste of Cubism, Futurism, and Vorticism in works by artists including Abram Games, Edward McKnight Kauffer, Man Ray, and Zero (Hans Schleger). Most of the poster artists were British; but by the mid-1930s London was home to a sizable community of émigré artists, many of whom had fled Nazi Europe. One of the most important of these refugees was the Hungarian painter and photographer László Moholy-Nagy. Arriving in 1935 at age 40, after an influential career at the Bauhaus, Moholy-Nagy struggled in his new city, piecing together a living with commercial photography, set design, shop window display, and the like. One of his freelance stints was for the Tube; and the handful of posters that resulted over the course of two years underscores the degree to which the public bureaucracy was ready to embrace avant-garde art. And vice versa; as the curator Carol Eliel notes, “Moholy-Nagy saw the artist as an essentially community-based role. To have a client like the London Underground would have been very comfortable for him.” 7 Moholy-Nagy was inspired by the system’s incorporation of new technologies like pneumatic doors and escalators; using simple perspectives and strong lines to convey motion and direction, his posters evoked the system’s proud modernity — and its role in driving the development of a cosmopolitan urban society. Moholy-Nagy’s posters evoked the system’s proud modernity — its role in driving the development of a cosmopolitan urban society. Frank Pick’s last years as head of the Underground were devoted to preparing the system for the approaching war (when Underground stations would serve as crucial shelters during the Blitz). He retired from the London Passenger Transport Board in 1940, and died a year later, at his home in west London, from a cerebral hemorrhage. But despite his outsize role in creating and managing what Jonathan Glancey describes as “the world’s finest and most fully integrated urban public transport system,” 8 Pick was for decades largely forgotten. That is perhaps the inevitable fate of even the finest public administrator, but recently Pick’s legacy has been newly honored in the city he so decisively shaped. In 2016, on the 75th anniversary of his death, a memorial was unveiled at the Tube station at Piccadilly Circus (which Pick had commissioned Holden to design in 1928). The installation, by the London-based artists Langlands & Bell, displays the words “beauty, immortality, utility, perfection, goodness, righteousness, truth, and wisdom,” taken from Pick’s notes for a speech, alongside his name in a roundel. Pick’s legacy can be seen in the public art programs that are commonplace for transit agencies around the world. Yet the celebrated art of its newest line was one of the MTA’s rare positive stories during a year in which the largest public transit system in the United States has endured what New York governor Andrew Cuomo admitted was a “summer of hell” — with shutdowns and accidents only aggravating the all too familiar grind of rundown stations, grimy cars, dilapidated tracks, and unreliable service. It’s become an all too American story of neglected public transportation — and more, of diminished public spirit. In prepared remarks, Cuomo described the Second Avenue station as “a museum underground [that] honors the legacy of building engineering marvels that elevate the human experience.” And, he continued, “Public works projects are not just about function — they’re an expression of who we are and what we believe.” These are sentiments that resonate with the ideals articulated by Frank Pick. Whether they will serve as a guide to action — whether we will once again not only invest but also believe in our public works — remains to be seen. John R. Kellett, The Impact of Railways on Victorian Cities (London: Routledge and Kegan Paul, London, 1969), 316. See Hugh Douglas, The Underground Story (London: Robert Hale, 1963) and Christian Wolmar, The Subterranean Railway: How the London Underground was Built and How It Changed the City Forever (London: Atlantic Books, 2012). Christian Wolmar, “Titan of the Tube: Frank Pick,” London Historians, November 2010. Margaret Timmers, “Introduction” in Oliver Green, Frank Pick’s London: Art, Design and the Modern City (London: V&A, 2013), 5. Interview with author, April 2017. Interview with author, April 2017. Carol S. Eliel is one of the curators of Moholy-Nagy: Future Present, which was on exhibition at Los Angeles County Museum of Art from February to June 2017. Jonathan Glancey, “Frank Pick: the forgotten genius of the London Underground,” The Telegraph, November 7, 2016. See Rachel Orol, “The Art of Subways,” Public Books, June 21, 2017; Kaid Benfield, “In Praise of the Stockholm Subway’s Breathtaking Art,” CityLab, April 22, 2013; and Hannah Twiggs, “Moscow’s metro stations — in pictures,” The Guardian, October 31 2015. See also Dubai Culture and Arts Authority, December 4, 2014; Los Angeles Metro Art; and MTA Arts & Design Program. Randy Kennedy, “Art Underground: A First Look at the Second Avenue Subway,” The New York Times, December 16, 2016.